TE Adams is playing his way off the team. Should have just let JPP move on. Adams can't catch a cold. We need colts to win. then we are 2nd pick. If colts lose. Then we're tied. The tiebreaker is this to begin. "Overall ties are then broken by strength of schedule, which is a calculation of the combined record of all of a team's opponents in that year, with divisional opponents counting twice. The next tie breaker would be record against conference opponents and then divisional opponents." Today... Indy is my second favorite team. Just win baby! Only thing missing is the fork..
How in the world did Washington win 7 games...? 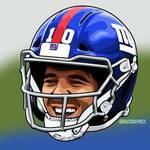 That's the type of throw we have not seen Eli make in a long time. Found this. And its ok for nyg to win even if colts lose and we're tied. WE WIN OR GET THE TIEBREAKER BASED ON STRENGTH OF SCHEDULE. We are 3rd in the ranking of strength of schedule. Colts are 29th. So its ok to root to win. We get the 2nd pick even if we win. In my 60 years as a giant fan this is what's it come too. And its the losingist season ever. So don't call me negative nellie I just found a reason to root and be a giant fan today considering this abysmal season. Odell is there that's a td. Its tryout day for these guys. Everything I read leading up to this game led me to believe if the Jints and Colts have the same record they will be picking #2. Hope you're right.